Overview: Late fall oysters are often referred to as being the harbinger of the end of the mushroom season in late fall or winter depending on the geographic location. They tend to fruit in groups, either in clusters or single. 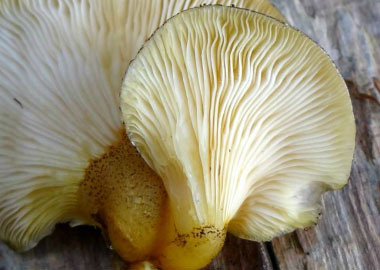 Late fall oysters are reminiscent of the more common oyster mushrooms, yet their greenish colour sets them apart from the common oyster. 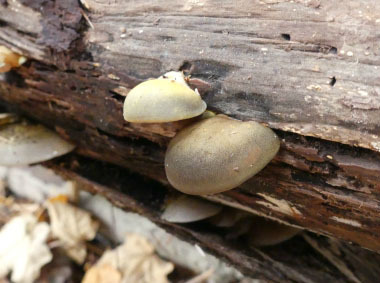 They are also known as Panellus serotinus. Distinguishing Features: The flesh of the late fall oyster is whitish; tough and rubbery, and does not change colour when sliced. 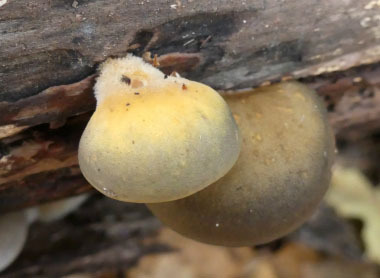 It has a sticky surface when fresh, and sometimes orangish-to-yellowish gills that develop brownish edges. These are easily spotted in the woods. 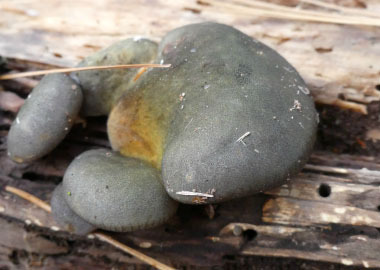 Fruitbodies range from 2 to 10 cm across; are semi-circle or kidney-shaped often with a scalloped incurved margin; convex; slightly downy when young, becoming smoother with age. 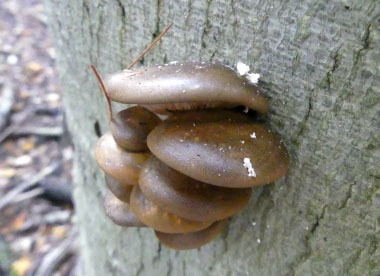 They typically have a stout stem, usually yellowish but sometimes light brown. Their slightly greenish colour sets them apart from other fungi and they have a slight yellowish colour where the cap meets the stem especially when young. 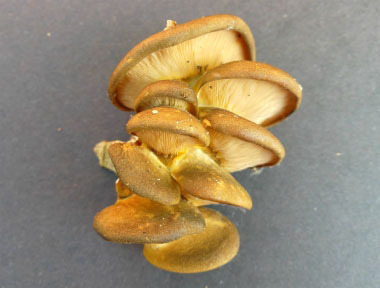 Height: Typically late fall oysters are quite short as their stem is lateral, stout, and up to about 2 cm long (and sometimes absent). 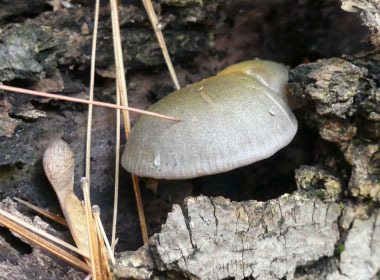 Habitat: This late fall saprobic mushroom is found in forests on the deadwood of hardwoods, usually on logs with bark still attached. 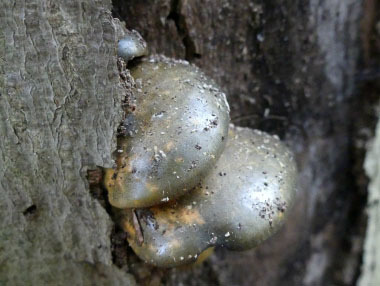 It can occur on dead conifer as well but is more common on hardwood. 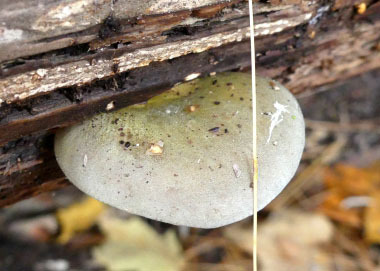 This mushroom grows in many locations across Canada, the U.S., Europe, Asia and in New Zealand. Spore print: White to whitish. Season: Late fall into winter depending on geographic location. Usually does not appear until the first frost. Gills: Gills are adnate, crowded, and initially yellowish becoming browner with age. 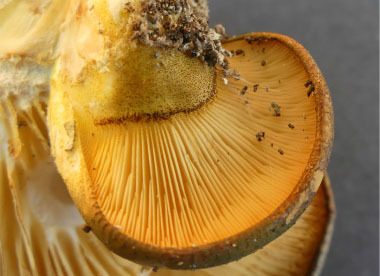 The gills radiate from the point of attachment. 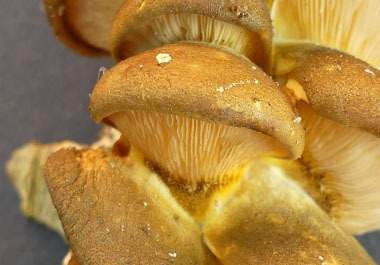 Edibility: In Japanese culture late fall oysters, or mukitake, is considered a very popular edible mushroom although it is not as common in North America. It dries well and is a great addition in a hearty stew. Its bitter flavour lends itself well to robust sauces. Although considered edible, it is quite tough and must be cooked a long time over low heat.